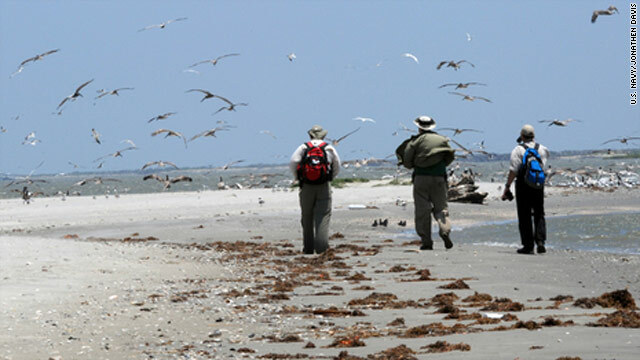 Members of a Shoreline Cleanup Assessment Team survey Raccoon Island, Louisiana, for oil debris Wednesday. (CNN) -- Natural forces, human effort and some good fortune have kept the massive oil leak in the Gulf of Mexico from becoming an all-out environmental disaster, scientists say. "So far, we may have been lucky," Steven Lohrenz, marine science chairman at the University of Southern Mississippi, said Thursday. 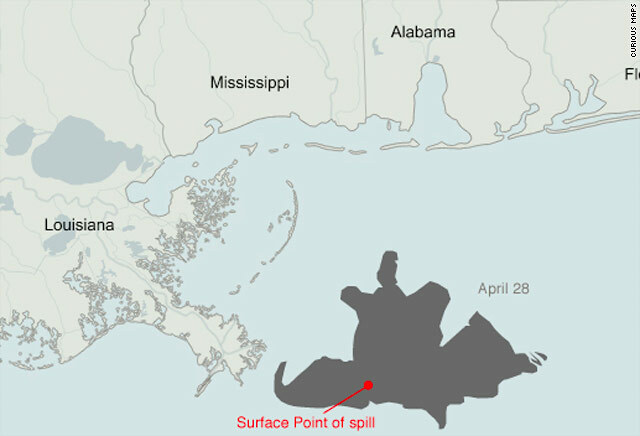 An undersea oil well 50 miles off the Louisiana coast has been gushing 210,000 gallons of light, sweet crude a day since a drilling rig exploded April 20. Eleven workers are presumed dead in the fiery accident. An effort to channel the leaking oil onto ships with a containment dome failed last weekend, and engineers were planning to try again Thursday with a smaller apparatus. An oily sheen has reached the shores of some of Louisiana's barrier islands, but there has been no repeat of the disastrous scenes of widespread oil-soaked wildlife and beaches, as in the wreck of the supertanker Exxon Valdez in Alaska's Prince William Sound in 1989. "One of the things that's been happening is, the weather has worked in our favor so far," Lohrenz said. Ocean currents and prevailing winds have carried much of the spilled oil away from the coast, although the wind has changed in the past week, he said. The physical properties of oil and water are factors in the forecasts, said Doug Helton, incident operations coordinator for the National Oceanographic and Atmospheric Administration. "We're mixing two liquids together," Helton said. "Every morning, when you pour milk in your coffee, you're doing the same experiment. It's a little hard to predict how that liquid will spread." Textbook diagrams of clearly defined currents are oversimplified, he said. All around the main currents, eddies move in different directions. "Oil can also get entrained in the main current," Helton said. "We're not seeing that right now, but we are seeing oil get entrained in these eddies." The type of oil spewing from the well helps the situation, Lohrenz said. "Sweet light crude doesn't have as heavy of a consistency, and it tends to break up and break down more rapidly than the type of oil, say, in the Exxon Valdez incident," he said. Gulf water is warm, but the oil is warmer and lighter, so within two to three hours, it rises in droplets 5,000 feet to the surface, where the droplets coalesce into a slick, Helton said. Some of it degrades during the ascent. Once at the surface, more of it evaporates into the atmosphere, where sunlight breaks it down into harmless elements, Lohrenz explained. A multipronged human effort has had an impact, too. "Several, several options are being exhausted here," said Adm. Thad Allen, commandant of the U.S. Coast Guard. "We have engineers that are on scene in Houston [Texas] with British Petroleum." The Coast Guard and BP burned off limited parts of the oil slick earlier in the effort, but waves have been too high and winds too strong to do that for the past few days, Allen said. Engineers were to try to place a "top hat" device over the source of the leak Thursday in another bid to channel the oil onto ships or stop the flow entirely. If that fails, crews are preparing to plug the well with debris in what is being referred to as a "junk shot." Plans also are moving forward to drill a relief well to extract oil before it reaches the damaged one. The state of Louisiana opened Mississippi River spillways to allow more fresh water to flow to the Gulf through the state's marshy "birdfoot" delta. The fresh water flows over the top of the heavier Gulf salt water, creating a physical barrier to incoming oil, Lorenz said. The oil then spreads out laterally, giving workers more time to skim it or use dispersants on it and the sun more time to evaporate it, he said. About 13,000 people are involved in the containment and cleanup effort, according to the National Oceanographic and Atmospheric Administration. The Coast Guard and erstwhile commercial fishing vessels have deployed more than 1.5 million feet of floating booms to keep the oil slick away from land. About 436,000 gallons of dispersant have been used, and approximately 4 million gallons of oily water has been collected, NOAA reported. "Once it reaches shore, it's very difficult to deal with, and the damage could be severe," Lohrenz said. The Florida Keys' fragile coral colonies are in no danger from the oil right now, Helton said. "It would take a long time to get to Florida," he said. "By the time it got there, it would already be degrading." In the meantime, the work continues. "The best scenario is, they could shut down the flow of oil, and we could continue to contain the oil at the surface, and over time, natural processes could take care of the oil and break it down," Lohrenz said. "The worst case is that we would have some kind of weather event that could push the oil ashore, especially into sensitive areas, and we have a lot of those along the coast."